The use of gardening as a therapeutic technique started in the 1940s and 1950s to rehabilitate veterans. Benjamin Rush, the founding father of psychiatry, believed that a garden setting has a curative effect for people with mental illness. 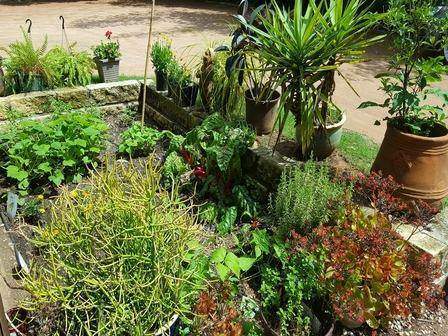 Today, garden therapy (also known as horticulture therapy) is used throughout the world and with various populations. Therapeutic gardening is based on the belief that through connecting and experiencing the natural world it helps to improve health and well being. Therapeutic gardening can be used by a trained therapist to achieve treatment goals. Benefits of gardening include: increased quality of life, coordination, balance, strength, responsibility, sensory stimulation, anger management, reduced stress, and can improve skills such as math, reading, social skills, gross and fine motor skills, problem solving and independence. The different typs of gardens include: healing gardens, sensory gardens, restorative gardens, and working gardens. Start out easy, if child is afraid of dirt, start by playing in the dirt with cars or other things that interest the child. Start planting in small pots that the child has to water, every session, and have them tell how the plant has changed since their last sessions. This teaches them responsbility, observational skills, and structure. Plant seeds using tweezers instead of fingers. Plant an edible garden so that children with food aversions can learn about different vegetables and have pride in growing their own food. Create a sensory garden with different smells, taste, and texture. AVOID daffodils or hyacinths becase their bulbs are very poisonous. Have the child water with a watering can instead of a hose. Collect leaves and flowers from the plants, dry them, and use them to create art projects.